FILE - Flags of Pakistan and China fly during a joint anti-terrorism military exercises in Abbottabad, Pakistan, Dec. 11, 2006. China is promising about $3.5 billion to help bolster Pakistan’s dwindling foreign cash reserves and pay for socio-economic development plans undertaken by the country’s new government. Beijing will soon deposit $2.5 billion in the State Bank of Pakistan (SBP), raising to $4.5 billion the total amount in commercial loans China has given Pakistan this fiscal year, officials and diplomatic sources confirmed. Minister for Planning, Development and Reform Makhdum Khusro Bakhtyar said Chinese experts are scheduled to arrive in Islamabad later this month to coordinate socio-economic development under the promised grant. Pakistan’s foreign currency exchange remains under severe pressure, despite receiving around $2 billion from China and $4 billion from Saudi Arabia and the United Arab Emirates in commercial loan deposits. SBP reserves stood at $8.2 billion last week, barely enough to cover two months worth of imports. In the last six years, China has made significant financial contributions to direct investment, soft loans and commercial deposits to help Pakistan, a close ally, overcome severe economic challenges. FILE - A Pakistan soldier stands guard while a loaded Chinese ship prepares to depart Gwadar port, about 700 kilometers (435 miles) west of Karachi, Pakistan, Nov. 13, 2016. The cooperation deal has created more than 70,000 jobs for Pakistanis and quickly resolved the country’s chronic energy crisis. But investments from China stopped because all major projects under CPEC will be complete by the end of this year. Chinese and Pakistani officials say preparations are underway to launch the next phase of CPEC in coming weeks to construct nine special economic zones across Pakistan. The CPEC has “changed the image of Pakistan” and encouraging other countries to invest in the country, notes veteran opposition Senator Mushahid Hussain, who chairs the foreign affairs committee of the upper house of parliament. He praised China for being the only country to bring unprecedented, massive investments to Pakistan five years ago when other nations were reluctant to do so because of terrorism-related security concerns and political considerations. 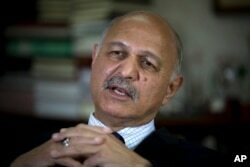 FILE - Mushahid Hussain, chairman of Pakistan's Senate Foreign Affairs Committee, is interviewed in Islamabad, Pakistan, Nov. 30, 2018. “Before CPEC, people were talking of a failing state, of problems of Pakistan. 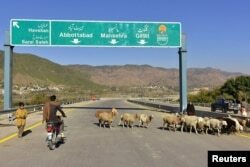 Today, Pakistan is part of the solution to key regional problems (including Afghanistan) and Pakistan’s image is that of an investor-friendly, tourism friendly destination,” Mushahid said. China believes a stable, strong Pakistan is in the interest of China, said Yao Jing, Chinese ambassador to Islamabad. China would like to align the development strategies of both countries and support development of Pakistan, he wrote in a recent article. Prime Minister Imran Khan’s nascent government has embarked on a major economic reform agenda to revive the country’s crisis-ridden economy and attract much-needed foreign direct investment. 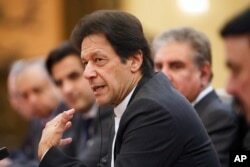 Khan has defended what he admits are “painful reforms,” saying Pakistan’s financial woes could not be addressed without taking tough, long-overdue measures. He blames alleged mismanagement and corruption by his predecessors for the ailing state of economy. The government has increased duties on luxury imports, significantly devalued the currency to encourage exports and raised prices of utility services, particularly natural gas, to generate more revenue. FILE - Pakistan"s Prime Minister Imran Khan is seen during talks in Beijing, China, Nov. 2, 2018. Officials defend their arrangement of emergency loans from Pakistan’s friendly countries, saying they are intended mainly to secure a breathing space for macroeconomic stabilization measures to take root and create a business friendly environment. In addition to lending urgent cash deposits of $3 billion each at an interest rate of about 3 percent, both Riyadh and Abu Dhabi have also allowed Islamabad to defer $6 billion in oil import payments for one year. Pakistani officials say the Saudi government has disbursed $3 billion and the process for $3 billion in deferred oil payments have been finalized. An agreement is expected to be signed when Saudi Crown Prince Mohammed bin Salman visits Islamabad Sunday. He was originally scheduled to begin his visit Saturday, but late Friday Pakistan’s foreign ministry announced the one-day delay without any changes to the prince’s activities in Pakistan. The prince is expected to announce projects worth up to $20 billion during his first state visit, Pakistani investment minister Haroon Sharif told VOA this week. The projects include a massive oil refinery in Gwadar with an estimated investment of around $10 billion. The UAE is working to establish an oil refinery in Pakistan and plans investments in other sectors. Malaysia, Qatar and South Korea are among other countries anxious to invest in Pakistan, officials said.